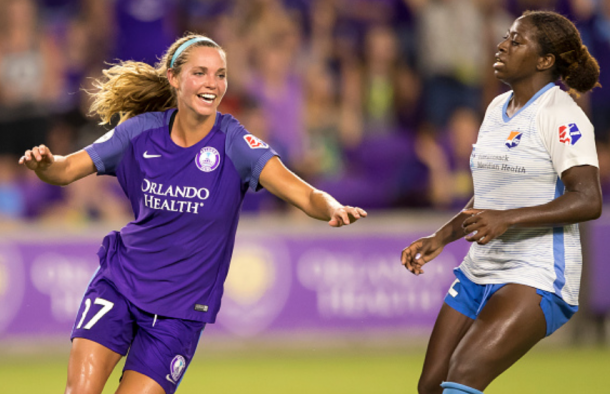 Orlando Pride and Sky Blue FC played to a 2-2 draw at Orlando City Stadium on Sunday night. Orlando Pride: Harris; Pressley (Evans, min. 85), Kennedy, Krieger, Weatherholt, Narin (Camila, min. 61), Van Egmond, Ubogagu, Edmonds, Hill (Morgan, min. 61), Marta. SCORE: 1-0, min. 51, Marta. 1-1, min. 53, Dorsey. 1-2, min. 59, Groom. 2-2, min. 73, Weatherholt. 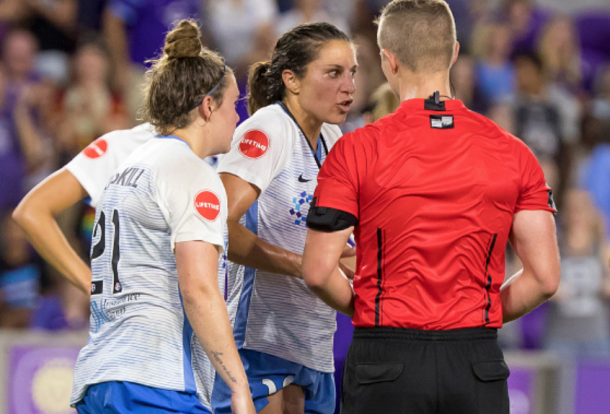 INCIDENTS: NWSL Regular Season match between Orlando Pride and Sky Blue FC. The match was played at Orlando City Stadium. 4,577 spectators. Sky Blue FC goalkeeper Kailen Sheridan once again saved a point for her team Sunday night. Sheridan came up big, stopping a Marta's penalty shot in stoppage time. Orlando Pride earned a corner kick in the 96th minute, midfielder Emily van Egmond headed the ball on goal that Sheridan was not able to reach. Sky Blue’s Carli Lloyd reach up and blocked the ball with her arm, keeping the ball out of the net. Lloyd was given a straight red card by referee Luis Guardia and Orlando was given a penalty kick. Brazilian international, Marta stepped up to take the penalty kick. Sheridan guessed correctly, diving to her left to knock away Marta’s low right footed penalty attempt. Orlando was able to earn another corner kick off the Sheridan save but could not convert. Both teams had to settle for the draw and one point in the standings. With the draw, Orlando Pride jumped over the Portland Thorns FC for the third spot in the NWSL standings. Sky Blue FC collected their fourth point and still searching for their first win of the season. There was not many chances in the first half and the match went into halftime 0-0. The best chance of the first half for Sky Blue FC came in the 28 minute when Savannah McCaskill sent a ball down the middle of the box that found fellow rookie Imani Dorsey one on one with Orlando goalkeeper Ashlyn Harris. Harris came off her line to save Dorsey’s right footed shot. Orlando’s chance in the first half came from superstar Marta in the 42nd minute. After Marta drew a Sky Blue FC foul near the top of the box, Marta’s free kick deflected off the wall and hit the crossbar. Dani Weatherholt had a chance on it but could get enough on the ball and Sheridan collected. Orlando’s Marta finally broke the 0-0 deadlock in the 51st minute. Weatherholt once again was involved in the play. The midfielder was able to get around the Sky Blue defense fired a high right footed shot that Sheridan was able to get a hand on. The ball bounced off the right post and fell right to Marta tapping it home to give Orlando the lead. The lead would be short lived as Sky Blue forward Dorsey scored the equalizer at the 53rd minute. After Marta hit the crossbar again, Sky Blue FC countered. Sky Blue striker Shea Groom held the ball inside the right side of the box and drew in three Orlando defenders. Groom lofted a pass to a wide open Dorsey who finished. Sky Blue FC would take their first lead of the season six minutes later. Substitute Carli Lloyd, switched fields from the left and found McCaskill on the right side in the box. McCaskill headed a cross that found Groom open in front to head it home. Unfortunately, Groom appeared to have suffered a head injury and had to be subbed off. Orlando was able to tally the equalizer by Dani Weatherholt in the 73rd minute. Weatherholt fought through the Sky Blue defense, Sheridan came out to collect but a bad bounce popped directly to Weatherholt. The midfielder followed and was able to tap the ball in with her head into an empty net. The squads traded more chances but were unable to finish and the match ended in a draw. Orlando will continue their homestand when they host Portland Thorns FC on Saturday August 11. Sky Blue FC will travel back to New Jersey to host the Houston Dash on Saturday August 11.